360 The Napinka Subdivision, Mile 0 to Mile 49. 2011/05, CPR /Napinka Sub. Mile 21, Clearwater yard, site of station. 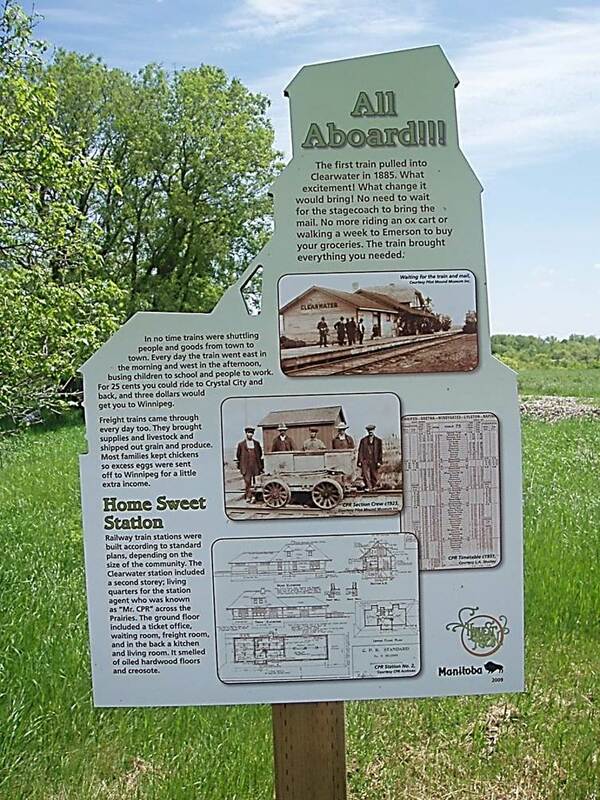 The sign describes a brief history of the impact of train travel starting in 1885. Also included is an unusual architectural drawing of a No. 2 station. This indicates a difference from the usual ‘type 2 station ‘ as indicated in the book, “Canadian Pacific’s Western Depots” by (Bohi and Kozma, 1993). Also, the station in the photo on the sign is a typical “type 2”, whereas the blueprint on the sign has some discrepancies with the photograph. (Information source, CPR Archives) (Click on photo for detail) © Text and Photos exclusive copyright of N. Froese. This entry was posted in Uncategorized on 2015-06-08 by nfroese.